The Pierre & Vacances Le Parc d'Arradoy residence is a neo-Basque residence, part of the park property since the 19th century. For relaxation: a heated pool, a paddling pool, children's play area, badminton and ping pong. Built in the typical regional style, the self catering apartments offer modern comfort and come fully equipped. To familiarise yourself with the charms of the region, a welcome drink is held in April, July and August. St-Jean-Pied-de-Port: in the heart of Pays Basque. A residence with a heated pool. Kids friendly: free activities for 6-12 years old. In the Pyrénées-Atlantiques, Saint-Jean-Pied-de-Port opens its gates to welcome you to its fortified mediaeval town. 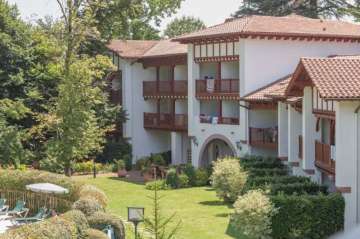 Soak up the view of the Pays Basque dotted with villages of white houses. St-Jacques de Compostela, go to one of the oldest roads in Europe. Bed height not suitable for children under 6 years of age. Decree No. 95.949 dated 25/08/1995.